A tasty scone recipe with a peppermint mocha twist, perfect for the holidays or anytime! When I was 18, I spent a semester in England. I became very familiar with scones (pronounced "sk-ahns" across the pond), and spent many memorable afternoons enjoying high tea with scones slathered in lemon curd and clotted cream! I've introduced scones to my family and they love them too! What's better than a breakfast treat that doubles as a snack, right? Chocolate chip scones are a family favorite, but for the holidays I decided to add a peppermint mocha twist! The scones are studded with mini chocolate chips and lightly flavored with International Delight® Peppermint Mocha Coffee Creamer. Yes, that coffee creamer that you enjoy in your morning cup of coffee can double as a flavor boost in your favorite recipe! A little drizzle of Peppermint Mocha frosting enhances the flavor! If I was baking these for company, I'd cut them into much smaller wedges; however, my family likes them big so that's how I made them! Sift the dry ingredients together, then add the chocolate chips. 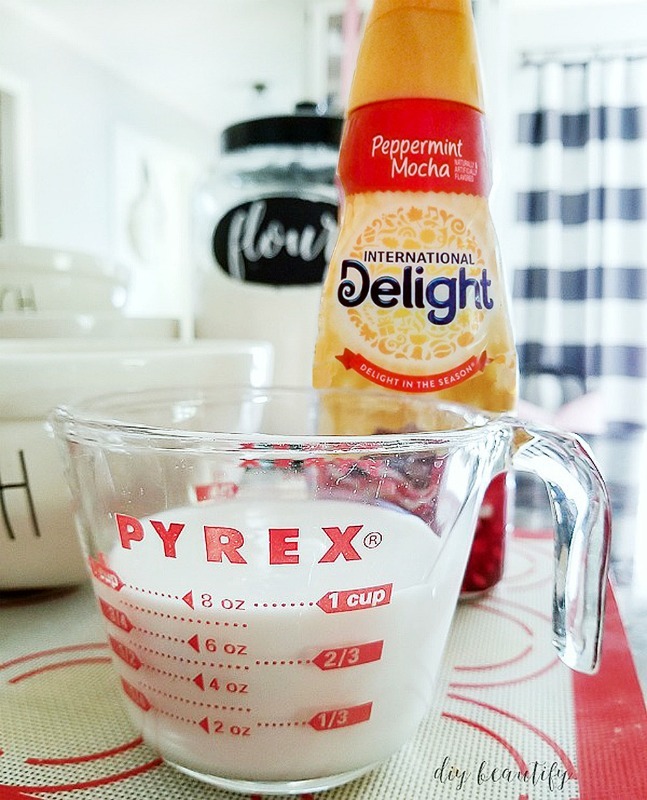 Measure the peppermint creamer and slowly add to the dry ingredients, mixing gently with a fork. Note: Scones can be tricky because over mixing will result in a tough dough! Just add a little liquid at a time until the dough comes together. You may need more or less liquid depending on how humid it is where you live. Turn dough out onto lightly floured surface and knead a few times to incorporate any remaining flour. Then press or roll into a 10" circle. Cut into triangles and place on cookie sheet. Bake at 425° for 11-13 minutes. Don't over bake! A toothpick inserted should come out clean. Let scones cool on a wire rack while you make the icing. Whisk together until well combined. Add more creamer if too thick and more sugar if too runny. Drizzle over cooled scones and serve immediately! That shouldn't be a problem; I find the smell of baking scones attracts kids to my kitchen like a magnet! I found the International Delight® Seasonal Coffee Creamers at Walmart in the refrigerated section. They have several seasonal flavors to choose from. I use Pumpkin Pie Spice® Coffee Creamer in my coffee every morning because I love the creamy swirl of seasonal spice! Make sure you check out all the seasonal flavors as many are only available for a limited time! My coffee/cocoa station is one of my favorite little corners in my home and gets daily use 🙂 The touches of red and plaid make it extra festive! If you love peppermint, which is such a classic holiday flavor, I know you'll enjoy these iced scones! It just doesn’t feel like the holidays without a splash of seasonal flavor. Stock up and make that merriment last! Peppermint Mocha Creamer is always on the nice list! Please feel free to PIN THIS IMAGE so you can refer to it when you're ready to bake a batch of peppermint scones! Have you thought of adding seasonal coffee creamers to enhance your holiday recipes? I'd love to hear about it! Thanks Emily, I hope you enjoy them!